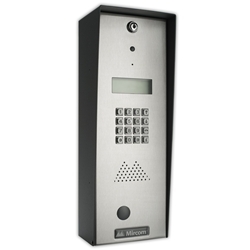 Mircom's TX3-200-4U Slim Line Telephone Access System is designed to provide primary resident/visitor access control for small condominiums, apartment buildings, office buildings, gated communities and industrial buildings with up to 200 residents or users. The slim design is ideal for applications with limited space, or for applications where a separate directory exists or is not required. The Universal Series enclosure is constructed of a heavy gauge stainless steel and can be used in a lobby or outdoors. Surface, semi-flush or pedestal mount applications are supported. The Universal Series enclosure features a built-in rain hood, microphone, tamper resistant speaker and has provisions for a postal lock and color camera to be installed. B suffix allows for a postal lock or a proximity card reader (extra charge).